Jan van Kessel the Elder was Jan Brueghel the Elder’s grandson (cf. no. 7). He was registered in the Antwerp guild in 1644/45 as a flower painter, but his work was not limited to this genre. He painted all kinds of still lifes (which were avidly collected) (cf. no. 23) and even landscapes. 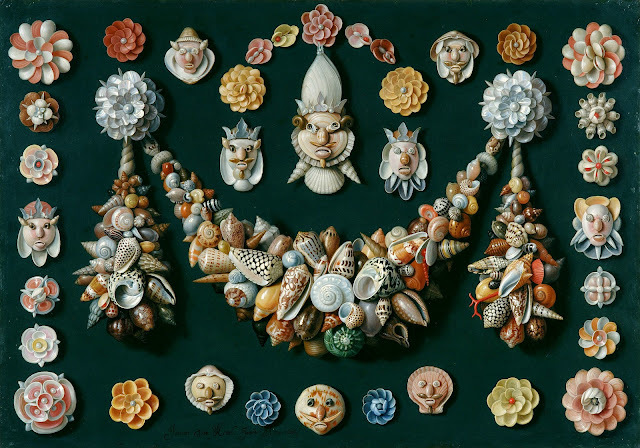 This painting on copper – a surface often used by Kessel – is exceptional in his work: it is the only known specimen of this type of decorative and anthropomorphic composition with shells. The work is in an excellent state of conservation, enabling us to appreciate fully the painter’s meticulous technique and gift for trompe l’oeil.